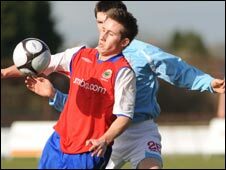 Linfield striker Michael Carvill has signed a new two-year deal with the Windsor Park club. The 20-year-old joined the Blues last summer and his initial contract is set to expire at the end of the season. "In addition to his enthusiasm and energy he has great technical ability and his skill levels are excellent," said Linfield boss David Jeffrey. Aidan O'Kane and Mark Miskimmin signed new two-year contracts with the league champions last week.